The American Mixed Martial Arts Fight League's MMA Fight Night 3 event turned into Fight Night 3 and Fight Day 3.5. The show was interrupted this last Friday night when a car crashed into a power pole near the venue, causing a huge power outage in the area. We were about halfway through when the outage happened, and the promoters huddled with PA officials before coming up with an ingenius plan: holding the second half of the card the next day, free. This was a unique experience, and many of the fans did in fact return the next day. On Friday night, the Newtown Athletic Club, where the fights were held, was jumping. It was standing room only and loud as fans cheered on their favorite amateur fighters. The second half of the show was filled with professional mixed martial artists, and all of the scheduled pro fights took place at 1PM on Saturday. Of all the fights scheduled, only one, an amateur contest, had to be scrapped. Not bad considering the unusual circumstances. CHESTER, Pennsylvania, [September 19, 2011] – For the first time ever in Pennsylvania, Pro Boxing fans and Mixed Martial Artist (MMA) fans will have the chance to witness both sports in one night. Harrah’s Casino in Chester, Pennsylvania will host Fall Brawl, a double header event with six Pro Boxing and ten MMA bouts on September 24, 2011. Xtreme Fighting Events (http://xfevents.com/) and main sponsor BoneBreakerz Clothing are promoting this unique event for fans of boxing and mixed martial arts to come together and watch the matches with intense sporting enthusiasm. 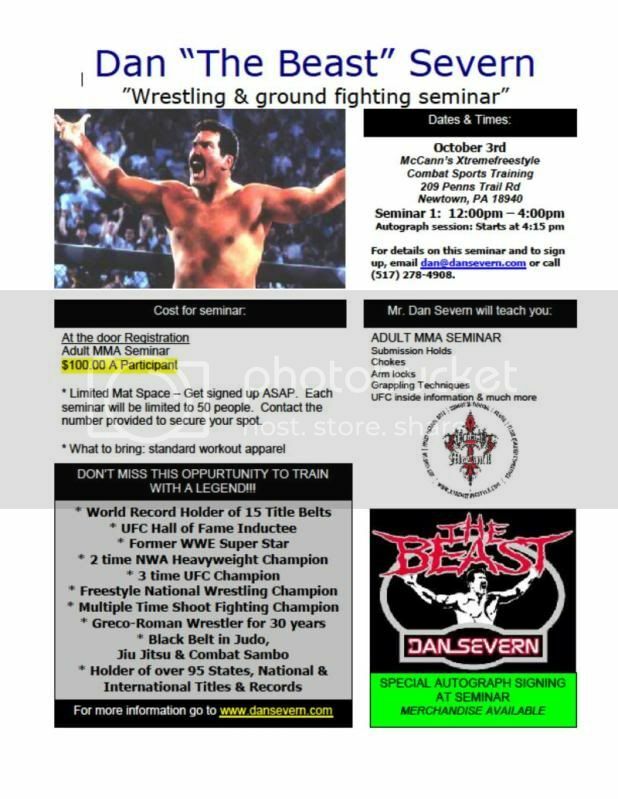 Dan "The Beast" Severn is a UFC Hall of Famer and MMA legend, and now you can train with him at a seminar in Newtown, Pennsylvania on October 2. The Beast will teach you everything from submissions to holds to locks to throws. And don't worry, he won't suplex you like he did to Anthony Macias in his UFC debut at UFC 4. But he might just show you how you can do that to someone else! The seminar is being held at McCann's Xtremefreestyle Combat Sports Training Center located at 209 Penns Trail Road in Newton, PA. The owner, Jim McCann, a former fighter himself and now promoter of the American Mixed Martial Arts Fight League, is an excellent MMA instructor and so this seminar will include a wealth of information that will make you a better fighter. And don't forget, on September 30, at the Newtown Athletic Club, same address as the seminar, the AMMAFL's MMA Fight Night 3 will take place, an event I will be hosting from inside the cage. Dan "The Beast" Severn will be there as well, mingling with fans, as will profession wrestling legend Jimmy "Superfly" Snuka. So this is a must-see event, not only for the aforementioned special guests, but because of the very high level of talent on the card. Such notable MMA fighters as Chris "Redline" Wing, Jesus Martinez, Jason Lee and Caleb Ball will all be competing, plus many more. For ticket info, check out the poster for MMA Fight Night 3 after the jump. 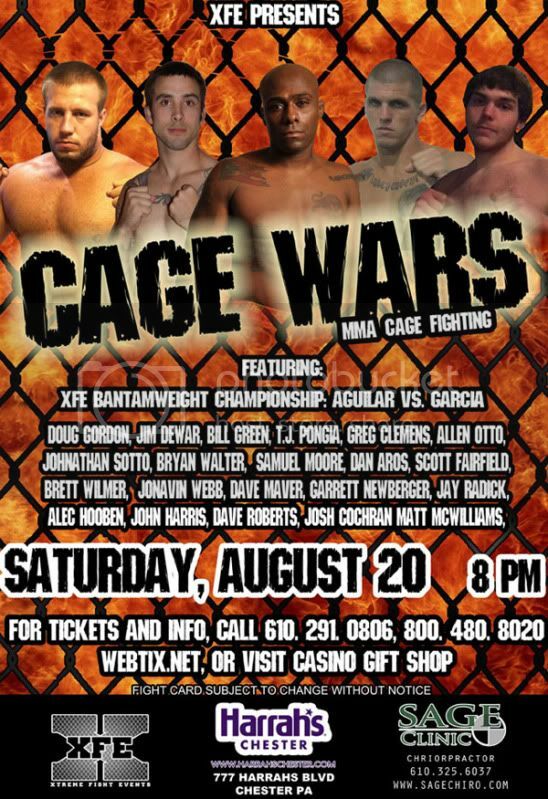 Excellent card tonight at Harrah's Chester in Chester PA. Cage Wars 9 returns, with the XFE bantamweight title on the line. Don't miss the action. Get your tickets now! The American Mixed Martial Arts Fight League is back! On September 30, 2011, the Newtown Athletic Club will once again be rocking as the AMMAFL presents MMA Fight Night 3. The first two MMA Fight Nights were a big success and promoter Jim McCann is looking to make the third time a charm. He's putting together some great fights and has some big name local talent planned for the show, which will once again be held at the Newton Athletic Club in Newtown, PA, just outside Philadelphia. Scheduled to appear on the card so far is Chris "Red Line" Wing, who fights out of the Wing MMA Academy and AMA Fight Club, home to the UFC's Miller brothers. Jason Lee will also be back for the third show. Jason lost a tough and very exciting war with Caleb Ball at MMA Fight Night 2, and he'll be looking to get a W this time out. Speaking of Caleb, he'll also be on the card again and looking to keep his win streak going. And Jesus Martinez, a fast rising up and comer will also be featured. And that's just the beginning. We'll have lots more on this card as it develops. I am proud to say that once again I will be hosting the show from inside the cage. Last time out, in addition to all the great fighters, we had VIPs such as Superfly Jimmy Snuka in attendance, and singing the National Anthem, Kathy Sledge from Sister Sledge. Jim McCann pulls out all the stops in his shows, and you can bet that MMA Fight Night 3 is going to be his biggest and best ever. Check out the AMMFL website for more details, and stay tuned right here. We'll have much more on this event in the near future. See you in Newtown! Promoter Jim McCann put on a hellavu show last night in Newtown, PA, at his MMA Fight Night 2 event. The card was a great mix of amateur and professional bouts and each contest was highly contested and hard fought. I had a great time at Master of Ceremonies and I'm already looking forward to the next event. The fights were fantastic and the crowd roared throughout the night. The Newtown Athletic Club was rocking as the fighters did what they do best: fight. Matchmaker Bill Shuker did an awesome job putting together very competitive fights. We saw Lewis "The Beast" Rumsey get slammed and take some big hits from Chris Sydnor before reversing the tide and finishing Sydnor by rear naked choke. Jay Haas looked great in stopping tough Steve McCabe by armbar. Caleb Ball and Jason Lee fought a very hard and close fight with Ball coming out on top by decision. Charlie "The Fight Monkey" Joseph earned his bananas by stopping Stephen Guvan and Sean "The Destroyer" Loeffler lived up to his nickname by stopping tough John Doyle by way of rear naked choke. The main event featured two East Coast staples, Justin Haskins and George "Lights Out" Sheppard. The first round was all Haskins. He landed some big shots on Sheppard and did some nice work on the ground. In the second round, however, Lights Out lived up to his nickname and landed a bomb on Haskins that hurt the Pellegrino MMA fighter. George then went in for the kill, taking Haskins down and continuing to rain bombs until the fight was stopped. I would love to see a rematch of this fight, because both men had their moments and the pace was fast and furious throughout. The American Mixed Martial Arts Fight League made a splash with its MMA Fight Night debut last October. This Saturday June, 4th, they are back with Fight Night 2, which promises to be even bigger and better. The event will take place at the Newtown Athletic Club, 209 Penns Trail Road, Newtwon, PA. Promoter Jim McCann pulls out all the stops when putting on a show. He likes to bring in VIP guests and tries to make the experience unique and memorable for fans.